Remember the Practical Magic-inspired kitchen I showed you last week? I thought you might like to see the rest of this newly built home in Huntsville, Utah, which caught my attention because it looks like it’s been there a lot longer than it has. It was designed by Derek Mecham with Oviatt Design Group, who says his clients wanted a new house with an old soul. The result was inspired by traditional Gothic Revival style. If you drove past this house, would you guess that it was finished last year? 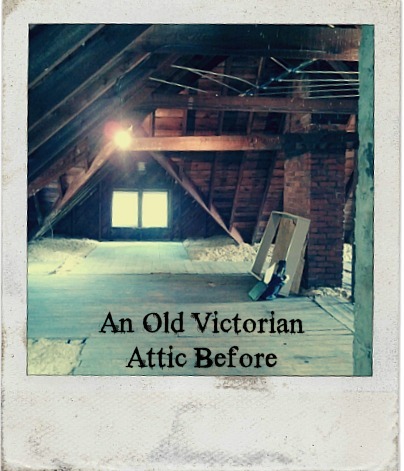 Take a look inside and see how they managed to blend the new with the old. It has truly fooled some people into assuming it’s an old house, Derek says. stained wordwork to achieve the effect of an older home. How fabulous is this window with the interior shutters? The kitchen was inspired by the one in the movie Practical Magic. See the similarities? You can see the rest of the photos and see side-by-side comparisons with the Practical Magic kitchen here. Gothic Revival was an architectural movement popular from the late 1740s through the 1870s. 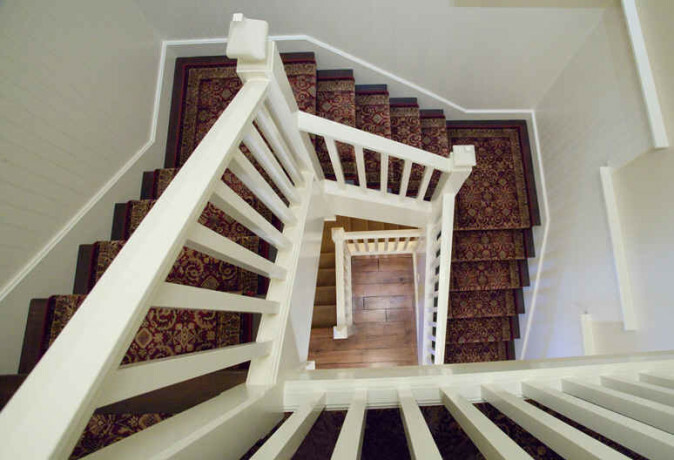 It’s sometimes called Victorian Gothic and was a contrast to the neoclassical styles that were prevalent during that time. 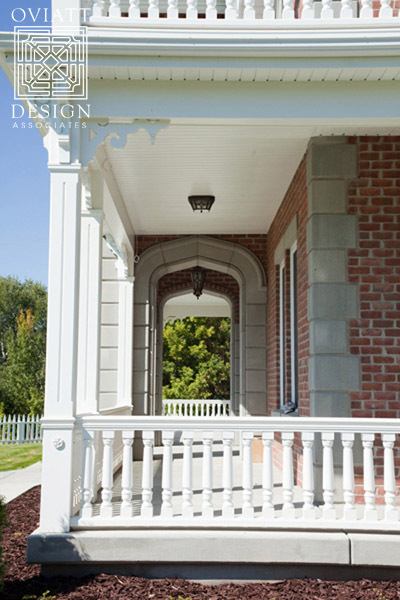 The most commonly identifiable feature of the Gothic Revival style is the pointed arch, used for windows, doors, and decorative elements like porches, dormers, or roof gables. Other characteristic details include steeply pitched roofs and front facing gables with delicate wooden trim called vergeboards or bargeboards. 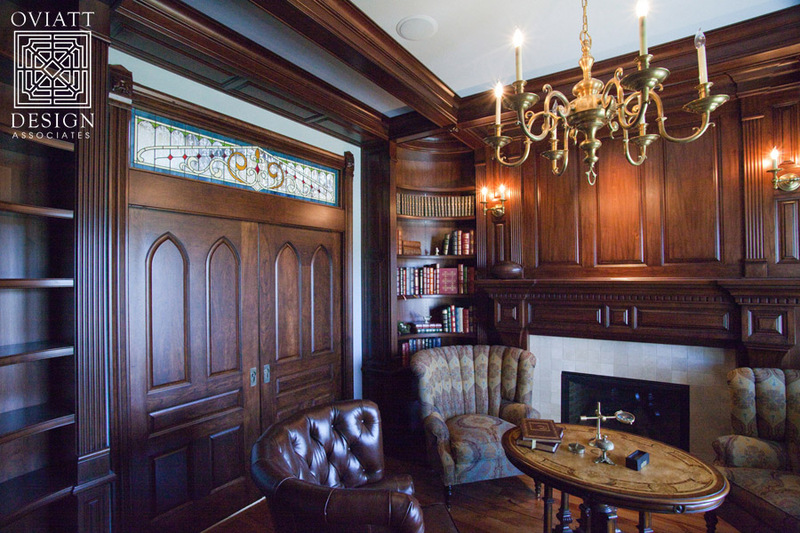 This distinctive incised wooden trim is often referred to as “gingerbread” and is the feature most associated with this style. 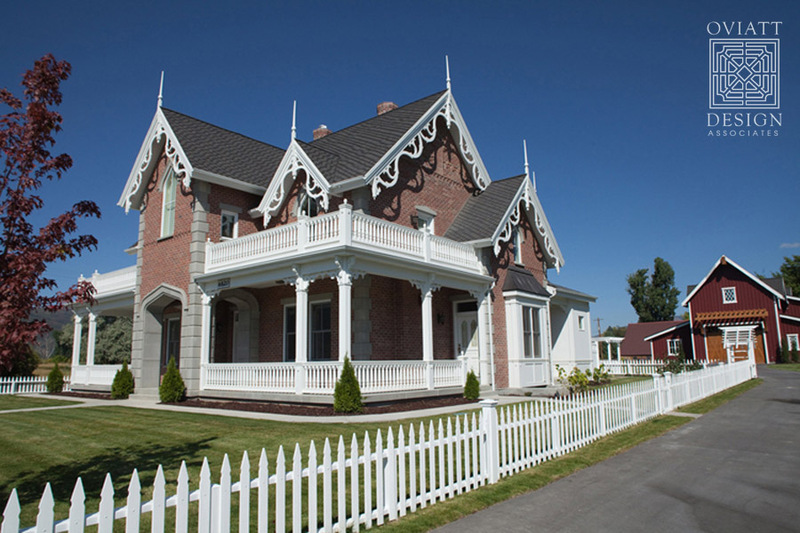 Gothic Revival style buildings often have porches with decorative turned posts or slender columns, with flattened arches or side brackets connecting the posts. Thanks to Derek for sharing this house with us! 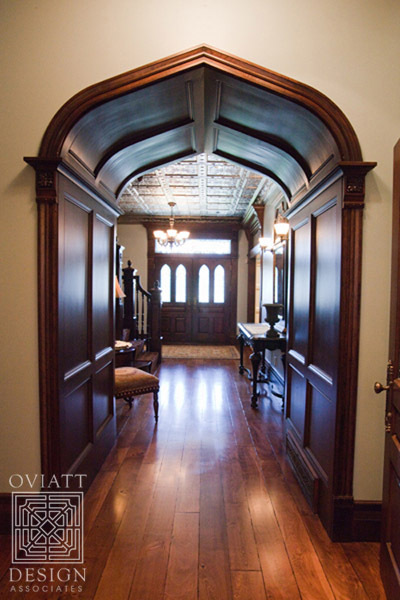 For more information about this new house built with Gothic Revival style, check out the entire gallery of photos at Oviatt Design Group. For more information about how they were inspired by the Practical Magic kitchen, click here. If you could build a new house with the character and spirit of an old one, what style and era would you go for? .-= Christine´s last blog ..Seafood is Where It’s At =-. .-= Gail Gray of A Fresh Start Professional Organizing´s last blog ..I’m Not Martha Monday – Making Fun of Organizing =-. This is really amazing. I can only imagine how much it cost to recreate this! I think I would have a Frank Lloyd Wright house but with all the modern amenities. That would be so phenomenal. .-= Lesley @ TheDesignFile´s last blog ..Beautiful, modern nursery in an urban condo =-. They really can build them like they use to! Wow! I don’t see a thing I would ever change! Absolutely beautiful! .-= Kelly´s last blog ..1900s Colonial, Sneedville, TN =-. That is truly an awe inspiring house. Derek really nailed it – the design and details are amazing! For myself, I would choose a cottage or bungalow style house from the early 1900’s. 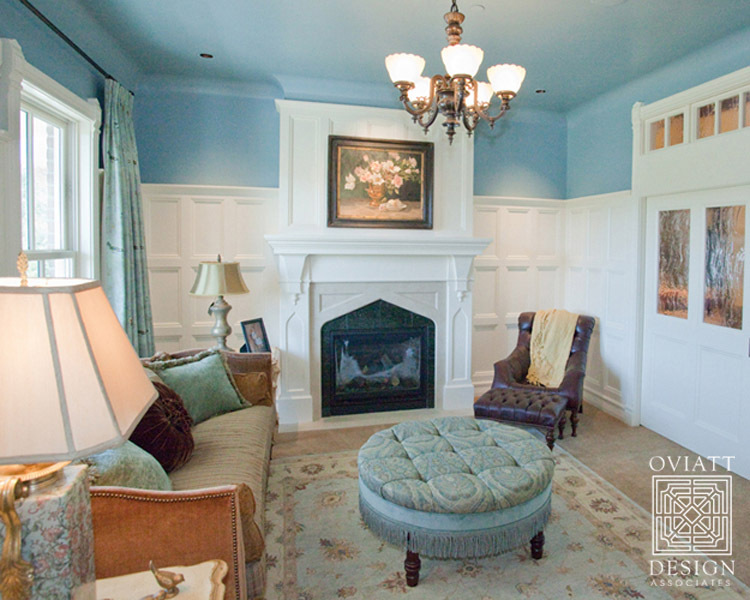 Although I like large homes, I prefer living in a smaller, cozy one with lots of character. .-= Cyndi´s last blog ..I "Borrowed" Hubby’s Camera =-. I do love this house. Especially the dark woodwork and the kitchen. PERFECT! .-= Alison Agnew´s last blog ..My Late-Winter Garden =-. The entire house is just stunning! I wonder if they used all new mill work or if some of it came from a restoration company? The period details are amazing. .-= black eyed susans kitchen´s last blog ..ART ALUMINUM… WENDELL AUGUST FORGE… A SAD DAY =-. wow amazing! I love how some rooms are so dark…but then others add such a night light element! with the blues and white…amazing! .-= Jen @ After The Alter´s last blog ..Food Revolution: Trader Joe’s =-. You are truly amazing. I love the posts you do. You feature some of the most incredible houses. Thanks for feeding my house addiction. A Manderly post??? Can’t wait! I always wanted one of those huge fireplaces that seem like you could just walk right in them. .-= Katie´s last blog ..Central Park =-. I think that house may be a little too Gothic for me. I do like some of the rooms though! I always go back and forth between loving Southern-style homes (ranch/plantations) or retro bungalows. If I had to choose now, I’d want a rolling ranch house with “Gone with the Wind” touches. .-= Amber´s last blog ..time for a giveaway! =-. Amazing. Just amazing! Especially the interior shutters and all that glorious woodwork. Love! .-= Hip Hip Gin Gin´s last blog ..Yes =-. What a talented designer…I would have totally thought I was stepping into a reno. Gorgeous. I am also loving that pretty blue room. I’ve never sat down to think about what style of home I’d want to have if I could choose a new home built in an old style. I wonder if there is some sort of online quiz for that sort of thing. 😉 I’ll have to think about it. My dream house is Clara’s house in the movie Lonesome Dove – it is two story and beautiful…. 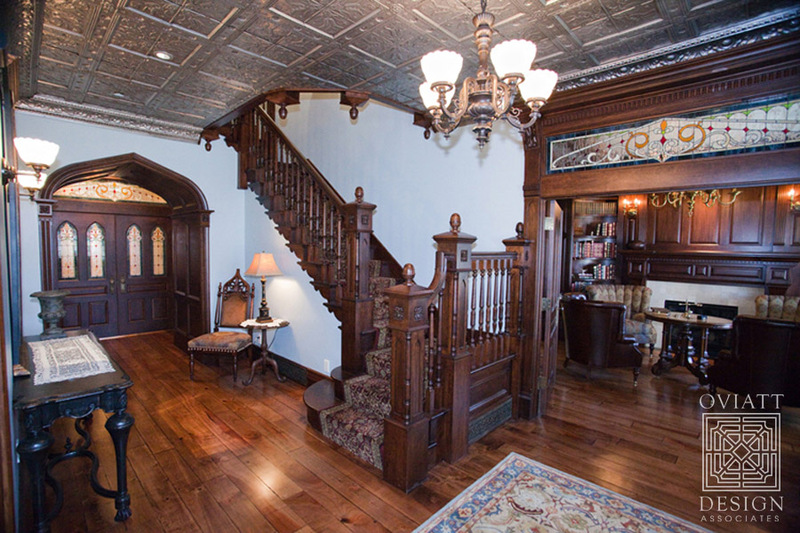 My favorite part of the house was the wood paneled hallway! Loved it! I would like a house from one of the Jane Austen movies. If we’re dreaming big I’ll just take Pemberley. .-= Julie Harward´s last blog ..THIS BEAUTIFUL WORLD… =-. I really really like the huge kitchen and the bedroom with the long posts…very cool! .-= Stephanie´s last blog .."Quiet" Theme, Wordless Wednesday , You Capture =-. I really like the light and airy rooms but it seems a little funny that there is such a contrast between the rooms with all white and bright colors and then the dark dark wood in other areas. Wow. I’m not a fan of all that dark wood, but I really admire skill that went into designing and building this home. My favorite spaces, besides that awesome kitchen, are the blue room and the other light space with the great gothic shutters. Can’t wait to see what you come up with for your Manderley post! .-= Tracy @ Comfort&Luxury´s last blog ..Wait. What Year is it Again? =-. I’d definitely go with one of those New Orleans Garden district Italianate/Greek Revival mishmashes. They’re my favorite! .-= rue´s last blog ..The snow is gone now… =-. Wow, great job Derek! My jaw is dropping right now. I love every bit of this house, the staircase, darkwood, kitchen, the outside, no wallpaper, and more. This is almost my dream home. My dream home is a victorian home. I want a turret on the front of it. Amazing- Exactly my style! Is Derek available to redo my kitchen? Ha- as if I could afford him! 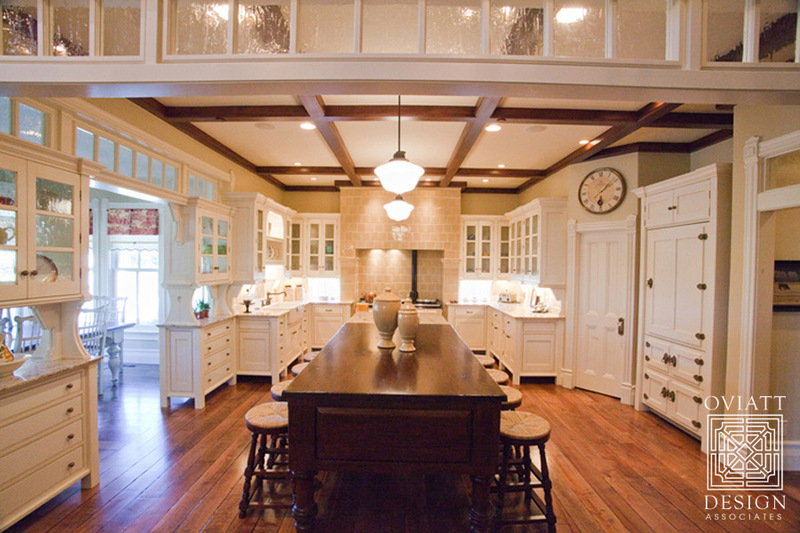 Oh my goodness that kitchen took my breath away. There is even a MORE amazing house in the new issue of House Beautiful. It is in Houston but is an Italian country house! Go look, it’s amazing! Hi Julia. I love your site. Wow. It’s lovey. I too am a house lover, as the saying goes a woman can’t resist a great house. I’ve just discovered your site and haven’t had time to go through all of it yet, but I can’t wait to. I used to live in Carmel, I was born and raised there and the Parent Trap trivia was fantastic. It’s things I’ve always wondered about and now I know, because of you. Thank you. I didn’t realize the exterior shoots were just a facade and not a real house. They did a very confincing job. I have always loved, loved that house. I agree with you the rooms flowing into courtyards and patios and balconies off of bedrooms, it has made an impact on me through my whole life, of wanting a ranch house and now finally having one. It’s not as wonderful or as spacious as the Parent Trap house but it’s in the same spirit and I hope one day it will be close. Anyway, thanks again for all the time you have taken to give all of this wonderful information, it’s been so much fun. Also, I am in love with the kitchen on this post. .-= Kim´s last blog ..If you’ll allow me… =-. I can appreciate the house for what it is, but it leaves me cold. 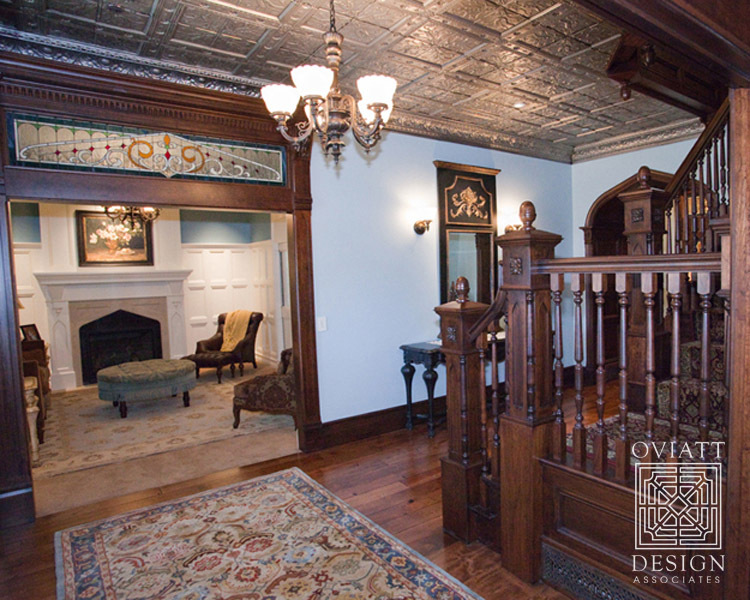 I personally can’t stand the gingerbread trim, and that dark parlor is way too imposing and cold. They did a wonderful job with many of the rooms, but some of it, especially in the hall/parlor/stair rails is just too ornate for me. .-= Carmen´s last blog ..Cute Easter Ideas from Martha =-. Gothic Revival houses are quite delightful, but if I could have any kind at all, I would go with one of the plantations in my area. Talk about romantic! .-= Amy´s last blog ..Ain’t She a Beaut? =-. What a meticulously planned and rendered home! Still, it is way too much house for me. I would dearly love a small stone cottage, maybe a story-and-a-half, with deep set windows and some unique masonry. The interior would be small scale with very basic amenities and as many built-in cabinets, bookshelves and window seats as could be accommodated without being too claustrophobic. It might sound odd but the icing on the cake would be pocket doors. WOW!! Isn’t it great how some people have money and can live like this? Lucky, lucky, lucky! This is gorgeous. It manages to be cozy and warm – not cold and museum-like. Really good taste and styling at work here! Rich details. I love all of the rooms, including the bedroom. I don’t usually like big poster beds like that because I don’t like big, sharp things in a bedroom. But it works in this room. 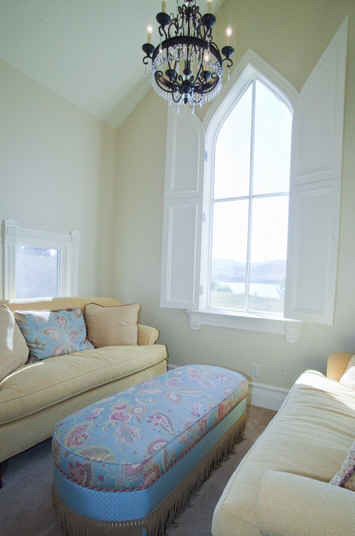 We also have interesting indoor shutters in the family room. Perhaps I could send you some pictures of our house and you could post them. Thanks for letting me take the grand tour. Although not my style, I do appreciate the magnificent detail work and style period. .-= Rita´s last blog ..Tish Is One Of A Kind =-. i love that bottom pic of the kitchen, but the house above is a bit “heavy” old style for me! .-= Annie@A View on Design´s last blog ..A striking Architectual home in Adelaide =-. What a gorgeous house….the kitchen is fabulous and my husband would fall in love with all the interior brick…He has a thing for brick inside of a house….I myself hate it only because he has tried using it in the past and he used faux brick paneling….Can you say…”Very very tacky!”…..only something a man would like. .-= Sue´s last blog ..LET’S PAINT THAT DOOR!!! =-. This is absolutely stunning!! I would love to own that house! .-= Lu Tapp´s last blog ..White Wednesday’s =-. Hi there Julia its almost bedtime over here 11.15pm but I had to check out your blog which is absolutely beautiful. I do love the Spanish Colonial style. In this house I loved the stained glass, the kitchen and everything else…thanks Julia goodnight from my side of the earth and goodmorning to you have a great day…. Regards Esther from Sydney with a starry night…. .-= rachel´s last blog ..ummm… tuesday thoughts =-. OMG I want that kitchen!…. beautiful!….I would love to build an ol’ farmhouse.. from the 1900’s…. .-= grissell´s last blog ..Random thoughts, I have very LOW number of entries of some of giveaways.. ENTER odds are good… 🙂 =-. I LOVE IT, ALL OF IT!!! 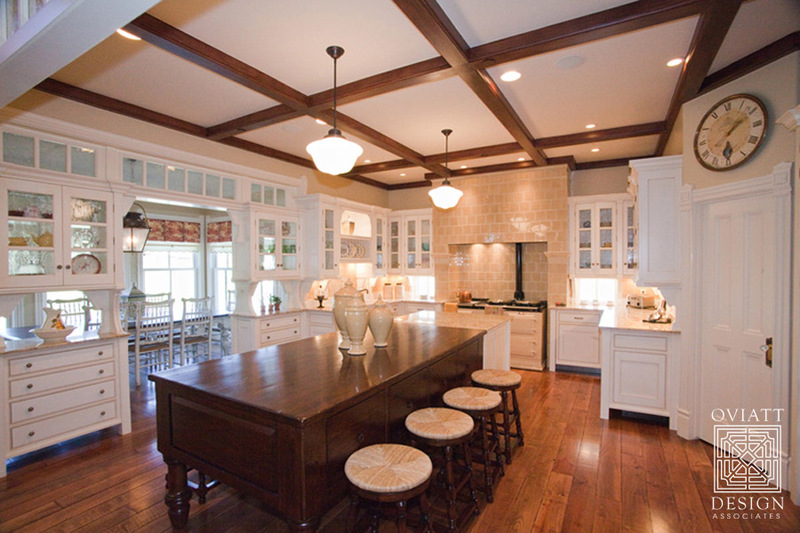 (I personally prefer the rooms with dark wood paneling over the one with white painted walls…) And what a kitchen!!! Woaw! Perfect! .-= Pascale´s last blog ..Elton John/Billy Joel Concert at the Rose Quarter (02-10-10) =-. I love this house. Another house that would be awesome if you could find photos of it is Charlies house on the TV show Numb3rs. .-= Josanne´s last blog ..My Marriage Tips =-. This is my first visit to your blog. I LOVE IT! I thought I was the only house nut out there! 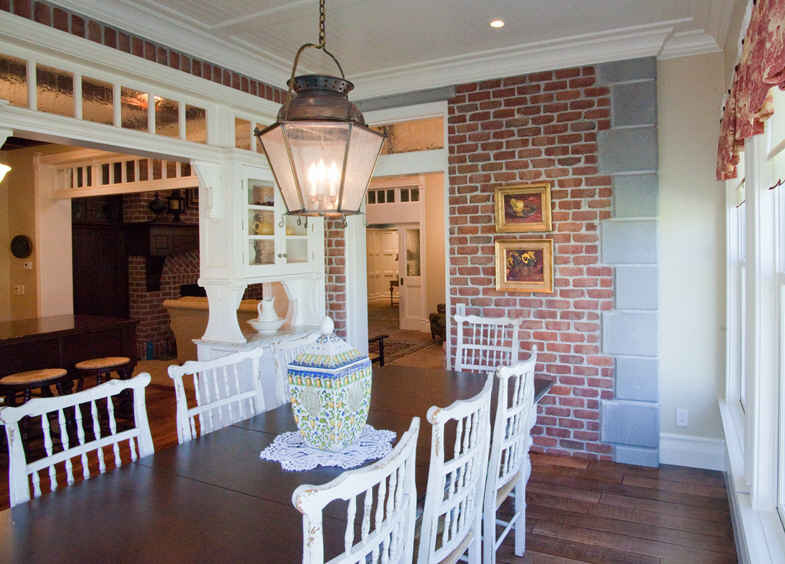 This house is gorgeous, although I’d skip the brick. I’m a big fan of yellow houses. .-= jennie w.´s last blog ..This could have turned out so badly =-.